1. Is there an overview of this terrible case? 2. Why was Schapelle going to Bali? Her father had been diagnosed with cancer. She was to nurse him through to his death (he sadly died in 2008). The trip to Bali was intended to recharge and rest to prepare her for this selfless ordeal. 3. Where did she get the money? She saved about half by working in a fish shop the previous summer. Her mother and father each gave her half of the rest. Schapelle and her family are not wealthy, so it took quite some time to save. 4. Where can I find detailed information on the show trial? This is harrowing, as it demonstrates the appalling nature of the show trial in clear and objective terms. Indeed. This was the only time in Indonesian history where marijuana had been intercepted allegedly from Australia. Even ignoring the street value factor, the origin was never determined, because they refused to test for it! See Schapelle's formal plea for the testing the marijuna for country of origin. 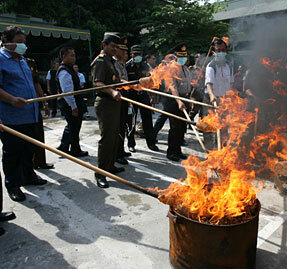 As explained in the video above, the drugs were subsequently burned so that these tests could never be performed. One can only assume that they knew exactly where they came from already: and it wasn't Australia or Schapelle Corby! Rather than even attempting to obtain legitimate secondary evidence (which never existed), they attempted a series of underhand measures, such as twice trying to trick her into signing a confession, written in Indonesian (which at the time she could not speak or read). Why would they do this, rather than fingerprint the bags/etc, if they didn't already know the outcome? 6. What is the story about the inner bag having been slashed? The marijuana was in a large transparent Space bag within the board bag: the inner bag had been slashed across its width to release the smell. This was presumably done to make sure that it was detected by the customs officer. No attempt had been made to hide the drugs within the outer board bag. In addition, the handle of the board bag had been broken, by accident or design. But it didn't even end there: the police officers on the scene immediately handled the plastic bags without gloves, and laughed when Schapelle protested. One can only assume that they knew the court would subsequently not allow finger printing or DNA tests. 7. How widespread is corruption in Indoensia? The problem of corruption is a massive problem in Indonesia. Even on the internet, scratch the surface with Google and you will find reports aplenty describing this, including many from the UN. Regarding the police specifically, corruption is almost the norm. 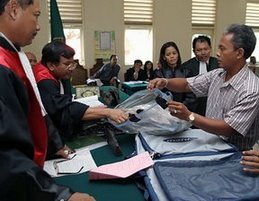 For example, even in 2009 after attempts to reduce the problem, a survey of 3,841 respondents by Transparency International Indonesia (http://www.abc.net.au/news/stories/2009/01/22/2472533.htm) found that bribes were paid in 48 per cent of all interactions with Indonesian police. They topped the list of the countrys most corrupt institutions. Second in the list? Indonesia's customs office: to which 41 per cent of respondents acknowledged paying bribes. 30 per cent of respondents said they paid bribes to Indonesian courts with $14,000 being the average payment. The United States Government also formally acknowledges this: "Widespread corruption continued throughout the legal system. Bribes influenced prosecution, conviction, and sentencing in countless civil and criminal cases" (http://www.state.gov/g/drl/rls/hrrpt/2002/18245.htm). 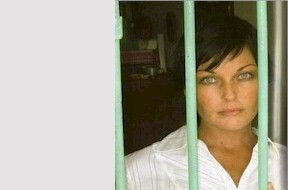 Schapelle Corby refused to even contemplate a bribe at any stage, believing that her innocence would result in justice. 8. What is the airport CCTV mystery? Schapelle begged for CCTV footage to be provided from Sydney and Brisbane airports, because they would show that her bag was empty on departure. After initially stating that the Brisbane footage was in good order they later changed this to state that the cameras were being repaired, and then finally to a story that they were turned off. The Sydney airport situation was even more disturbing: despite a major drug operation being underway and a flight carrying cocaine being there at EXACTLY the same time as Schapelle, they too stated that they had no CCTV footage available! No cameras running across two major airports, post 9/11 and post the Bali bombings: that is what we are supposed to believe. The CCTV footage from the airport in Indonesia, which would have shown Schapelle's shock at the find, and proved her version of events at that location, was simply not commandeered by the court, and was instead erased! The judge had initially agreed to look into it, but he later stated, “We’ll get it if we need to”. Disgracefully, he never found 'the need' - yet again one can only assume because he knew that it would collaborate Schapelle and discredit the prosecution even further. 9. Is Schapelle a drug user? Absolutely not. In fact the only tests that were performed in Indonesia were blood and urine tests: she was negative for all drugs (note that marijuana traces stay in the blood for over two months). Even now, when there could be temptation to numb her pain with the variety of drugs which are readily available in prison, unlike many fellow inmates she chooses not to. 10. Who put the marijuana in her bag? 11. What are Schapelle's conditions in prison like? waste whenever the Balinese hole-in-the-ground toilet blocks"
12. Why have the Australian government done so little? In a nutshell, because Australia's strategic relationship with Indonesia trumps Schapelle Corby's human rights. Australian/Indonesian relations are of significant importance to the West. This is largely because Indonesia is the largest Muslim majority country in the world, and is not currently under the control of religious fundamentalists. It is therefore closer to the West than many similar cultures. It is thus strategically important that this political position remains stable, particularly with respect to issues such as terrorism. Through its proximity to Indonesia, Australia is instrumental in maintaining the equilibrium. However, when the Schapelle Corby case emerged in 2004/5, that relationship was heavily strained. The Australian public were horrified by what they saw, and the government were under pressure to act. Suddenly, this was a highly political issue. But politicians are politicians. The Australian Prime Minister was in a corner: the public wanted Schapelle to be freed, yet to the West and to politicians, the strategic relationship was vital. No surprise therefore about which took precedence. The government consequently wriggled and squirmed, and ultimately used the media to subdue public opinion. Schapelle Corby was dispensable, as was her family. 13. What is the Schapelle Corby Smear Campaign? 14. Who is Tara Hack? 15. Didn't she write a book? Yes. During the first months of her imprisonment she somehow found the strength to write a book from her filthy overcrowded cell, with Kathryn Bonella, to detail her nightmare. The publishers describe it thus: "Schapelle's story is an account like no other - of a young woman experiencing the unimaginable and enduring total hell with courage, strength and humour. It's simply the most unforgettable book you'll ever read.". Schapelle of course paid, and is paying, a price for this, as it reveals a reality which a number of parties would prefer to remain hidden. Reading it is certainly a harrowing experience: one can only imagine what living it must be like. The royalties from sales of the book were intended to help soften some of the terrible pain of certain aspects of an ordeal in a foreign prison: for example, fund visits by her mother from her native Australia. But even here, a foul and brutal hand came into play, when the Australian government confiscated them under their "proceeds of crime" legislation! The international version of the book can be purchased via Amazon. 16. How is Schapelle coping? Not very well. Existing in those appalling conditions for a short period is a terrible ordeal. To face a barbaric 20 years, having been abandoned by your government years ago... and when you are innocent... it is barely imaginable. She is being treated for clinical depression and related conditions, and is naturally losing hope and crying frequently. As described under 'stealing her soul' ref her book "Schapelle, empty, lost and numb; her soul drying up and the sparkle in her eyes fading away.". 17. Is there any sort of support forum? Yes. A support group has been created on Facebook: People For Schapelle Corby.